This is a sponsored post partnered with Newark Chrysler Jeep Dodge. All opinions are honest and are my own. • Less depreciation of value. 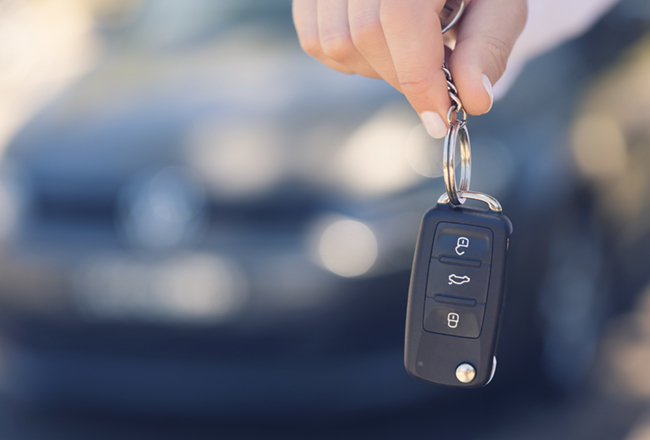 A new car can depreciate about 30% in value within the first year you own it, but if you buy a one-year-old car you can take advantage of getting a lower price and minimizing your loss of value. 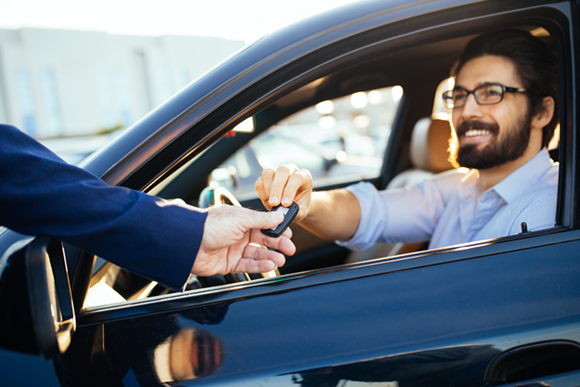 This isn’t a detail that you notice when buying a new car, but a few years later (or even just one year later), trying to trade this new vehicle in towards a newer model will most likely affect its value by as much as 30%! • You can afford a better car with more “extras.” Many people buy used luxury brands that they could never afford new, or can get packages in vehicles that would just cost too much for budget in a new car. We have friends who bought a used minivan that came with a great DVD player system, and they never would’ve been able to get that in a new vehicle. By saving on the depreciation mentioned above, you can move your selection criteria up to a new tier of vehicle. • Better insurance rates. Can’t beat that, right? If you have a newer car, it has greater value, and higher insurance costs. On the flip side of that, a lower value vehicle costs less to insure. Not only that, registration renewal rates are cheaper for a used car, going down in price each year. • Broader choice. With used cars, your pool is opened up to makes and models from a variety of years rather than what’s currently out. You’re more likely to be able to find exactly what you’re looking for. It may add to how long the process takes, but you’ll end up completely happy with your find. This is a sponsored post partnered with Robert’s Chrysler Dodge RAM Fiat. All opinions are honest and are my own. The cost of gas can add up quickly, right? Even when we’re not driving our car out of town we can blow through a tank of gas way more quickly than seems possible. You can’t always help how much you’re driving, of course, but you can take steps to make your dollar stretch just a little bit further. Try these tips today to see a difference in your spending on gas! 4. Drive less! Sounds simple enough, but think about what all you need to do next time you need to drive somewhere, and how you can best plan your route, along with what all you need to do in the near future. Any way to chain together a few errands at once? 5. 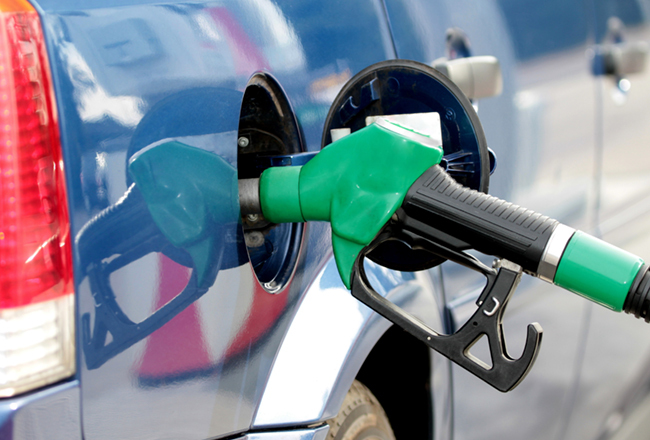 Purchase your fuel either late in the day or early in the morning. This works especially well in the summer months. When you puchase your gas during the cooler hours of the day, the density is higher, so you will pump more. Also, if you time your fill up in the first part of the week (Sunday-Tuesday), traditionally those are the days with lower pricing. Later in the week/weekend is when prices are raised for more weekend travel. 6. If you are waiting for someone outside in the parking lot, turn off your vehicle. Sitting idle while waiting is another waste of the fuel, not to mention it is just adding more harmful pollution to the atmosphere that can be avoided easily by turning off the engine. 7. Keep an eye on the tire inflation. Driving your vehicle on underinflated tires significantly uses more fuel while driving, not to mention it also adds avoidable wear and tear on your tires, thereby adding yet another cost to your budget that could’ve been avoided. This is a sponsored post partnered with King Chevy Buick GMC. All opinions are honest and are my own. • First-aid kit. You might be thinking “duh!” but the majority of you reading this post now probably don’t already have one in your car, do you? It’s one of those things we know we need, but we never get around to purchasing. Do it now before you get on the road! You can find really basic first aid kits, or – like this emergency kit we’re putting together – you can assemble your own. Neosporin, band-aids, antiseptic wipes, gauze, adhesive tape, and aspirin are all great things to include. Think about kids’ versions of medicines, and consider any medical needs specific to members of your family. • Fire extinguisher. Make sure you get one rated for Class B (those that involve flammable/combustible liquids, like gasoline, diesel fuel and kerosene) or C (those involving electrical equipment like switches and batteries) fires. If your engine catches on fire, you’ll be glad to have this on hand. • Jumper cables. This is one of the most basic must-haves for any vehicle; even when NOT on a road trip we’ve had to use these to jump our vehicle or to help other people out. Jumper cables are inexpensive and compact, so it makes sense to have these in your vehicle. • Blankets and water. If you get stranded you’ll be thankful for the warmth. In the summer, if you get caught in a hail storm a blanket might be your only line of defense between you and the hail. Blankets can be used to cover expensive items in your car, too. Water is important to have if you get stranded on the side of the road (you don’t want to get dehydrated)! 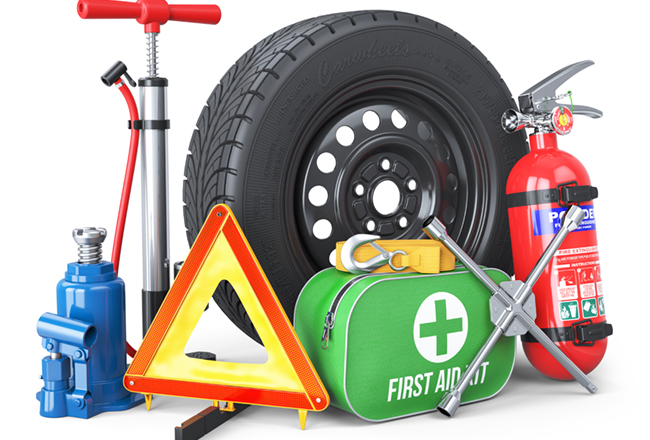 • Foam tire sealant, a spare tire, and all the necessary tools for changing a tire. Foam tire sealant is an inexpensive temporary solution when you get a flat, and it could mean the difference in you being stranded in the middle of nowhere or making it to the nearest town for help. We’ve had several flat tire issues on road trips over the years, so I can’t stress the importance of this one enough. Make sure someone on the trip knows how to change a tire, too!